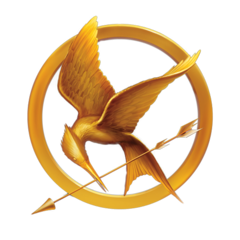 I have never displayed the “Friend of Emergent” badge on my blog. Oh, I considered myself Emergent-friendly, but it always stuck in my craw that displaying the badge came with a price tag — literally. If you contributed to EV, became a member, whatever, then you were invited to display the badge. You couldn’t “just” be a friend. You had to buy it. I never liked that whole concept, and as time went on, I became a Friend of Missional instead. That was free, thanks to my friend the Blind Beggar. I didn’t have to join anything, pay anything, or buy anything — I just had to be friendly. That’s all minor stuff though. What became larger to me was the way in which it felt like Emergent Village was attempting to colonize a free conversation that was already happening at the grassroots level. EV had the big names — McLaren, Pagitt, Jones, and others — but the conversation was going on with or without them in the pews and coffee shops of the nation(s), among evangelicals, post-evangelicals, and mainline denominations, with leaders and with laity, in living rooms and around kitchen tables. EV didn’t start the emerging church, they just happened along and tried to help give voice to it, to organize it. In and of itself, this is not a bad thing. Helping to fuel a conversation that people are truly engaged in, that they are seeking without knowing it, and helping them to find like-minded people asking similar questions, and having the freedom to come up with different answers. This is all profoundly good. But EV’s involvement didn’t feel like that. By 2006-ish, it felt like emerging colonialism, like EV was attempting to brand the grassroots. The trouble was, the grassroots was still reacting to having been branded and denominationalized and told what to think in the first place. And they were doing just fine, thank you very much. 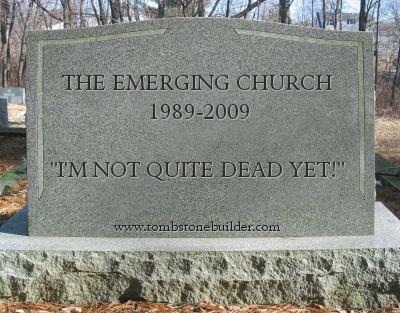 The death of the emerging church was proclaimed at the end of 2009, sort of, when Andrew Jones posted about its death. Well, not really — what Andrew said was, “In my opinion, 2009 marks the year when the emerging church suddenly and decisively ceased to be a radical and controversial movement in global Christianity.” (emphasis added). See, he didn’t say it ceased to be a movement at all, he was just talking about what kind of movement it was… basically, it was becoming more mainstream. Almost everybody missed that though, even after he explained himself, and still credited him with killing the emerging church. There was a schism already happening at that time where the emerging “conversation” was fracturing into separate streams or branches, which I commented upon at length back in 2008 and again in 2009. This is how less than two weeks after Andrew allegedly drove a wooden stake through its heart, I was still making predictions about the future of the emerging church. Actually, I was being a little gutsy and making predictions for the decade — so far I’ve been right, and the second half of the decade is on track for what I said 5 years ago would happen, so that post is still worth a read for current context. That was the beginning of 2010, when I decided I might be Neo-Emergent, and others were saying their goodbyes to Emergent™, although it retained a few distant friends. Today, the emerging church is still out there in the grassroots but in various forms rather than a cohesive whole. EV was perhaps a casualty of the fracture that’s been described, or was perhaps a casualty of its own strategy. Attempting to colonize anticolonists is not a particularly effective tactic for gaining traction to become the greater umbrella of an Emergent denomination. It’s not going to work — and it didn’t. It was likely never a conscious strategy or stated goal, but if it had been, what they were doing is exactly what you would do to try and achieve such a goal. Just sayin’. So the emerging church never really died, it just went underground and emerged as different things. It is, in fact, still going on, and still emerging — though it’s hardly ever called that anymore. Emergent Village died, and re-emerged as different things as well… Outlaw Preachers, the Christianity21 conference(s), and other initiatives through JoPa Productions, JoPa being Tony Jones and Doug Pagitt. 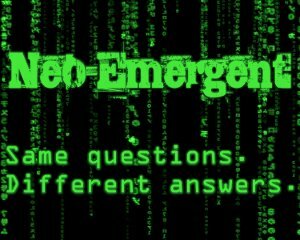 Recently I’ve been learning some things I didn’t know about how Emergent was founded, how it came to be, and who was involved in its formation. Those things took place before I was really paying attention to it, while I was engaged in the wider emerging church conversation. It turns out that Emergent was born out of the Young Leaders Network (note, not the similarly-named Young Leadership Network), an initiative of Leadership Network around 1996-99. Emergent™ emerged from that milieu, took shape, and ramped up from around 2001-2004 or 2005 (See chronology by Brad Sargent). For reference, Andrew Jones has considered possible start dates, and places the emerging church movement’s beginning in 1989. The Wikipedia entry for emerging church quotes Marcus Borg in 2003 as referring to it over the previous 20-30 years as having become “a major grassroots movement among both laity and clergy in ‘mainline’ or ‘old mainline’ Protestant denominations.” The article also cites uses of the terms dating back to 1970, so it’s been around for a while, and longer than I had realized. Grassroots movements are always hard to pinpoint a starting point for. To the outsider, it appears like a number of people led by Jones and Pagitt along with McLaren did a sort of colonizing of some group within a YL initiative and branded it Emergent. Emergent then set about attempting to colonize and brand the wider emerging church conversation, becoming the sole voice of the emerging church. Thank God that didn’t work, but I’m still saddened by the fact that the EV association by terminology with the wider emerging church scared many people away from it. Thank you D.A. Carson, who like many people erroneously equated the emerging church with Emergent. Doug Pagitt is widely known as primary cofounder (with Tony Jones) of the emerging church, a movement that responded to stasis in the traditional church. He is pastor of Solomon’s Porch, a congregation in Minneapolis that focuses on addressing human needs in the neighboring community and facilitating a more personal encounter with God. He is also host of Doug Pagitt Radio and the author of several books, including A Christianity Worth Believing, Body Prayer, and Evangelism in the Inventive Age. Pagitt and his wife, Shelley, live in Minneapolis. 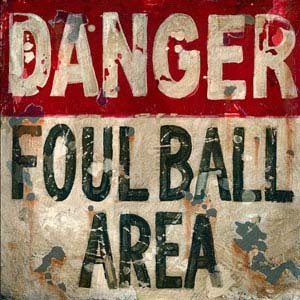 I call “foul”. Neither Pagitt nor Jones founded the emerging church. 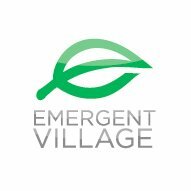 They were some of the founders of Emergent Village, which is not the same thing. Not at all — and the longer that the two ran, the less synonymous they became, until one died and the other had to change its name. And now the ones that ran the dead one are claiming to have founded the ones that didn’t die at all? Shameful. Just shameful. Reminds me of that story in the Bible where two mothers each had babies, and one of the children died in the night so they disputed which was which. Solomon saw through that as well. Of course, it seems that on his Porch nowadays, things like truth, wisdom, and justice no longer hold sway. One would have thought someone over at Convergent Books (Crown / Random House) would have vetted the bio a little more carefully, but you’d hardly expect to have to fact-check a bio, would you? Alas. On the other hand, if you’re in the revisionist history business and you wanted your Emergent™ brand to appear to have been the be-all, end-all of the emerging church movement, you’d want to say that you had started the whole thing in founding Emergent™, and you’d be fully promoting the confusion in terminology. 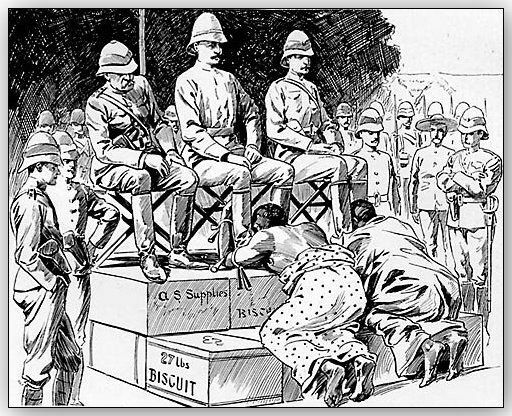 Because that’s how you do revisionist history to say that you hadn’t colonized and almost killed anything. Rather, you be saying that you started it and then changed its name to “Progressive”, or “Convergent” or some such thing that was the new heir apparent rather than merely one of a number of branches that “your thing” evolved into. Then it wouldn’t just sound like so much self-aggrandizement, it would sound like you’d won the Theology Games. Did anyone else know they were even playing? Thank you for covering this story, as well as Bill Kinnion, David Hayward at The Naked Pastor, Dee and Deb at The Wartburg Watch (North Carolina), and Julie Anne at Spiritual Sounding Board. Dee and Deb at The Wartburg Watch have started a fundraiser to help Tony Jones’ ex-wife Julie M., given all of the family law attorneys’ expenses and other hardships (and basic life expenses) that she’s faced with Tony Jones’ taking her to court all of the time….for years. He left her and their three small children while he took up with some other woman (who was also married). Every donation helps (large, small, medium) as we help this mom in her distress, something that the Emergent leaders FAILED to do. Spring is coming and there’s some other great ways to help…such as declutter your home and have a yard/garage sale and donate the proceeds from your sales, or a part of the proceeds, to this fund. I don’t know Julie M. But I care deeply about her and the fact that the Emergent Crowd has silenced her voice for years.